Open 8am - 8pm weekdays, 9am - 4pm weekends & most bank holidays. For Christmas & New Year open hours please see here. Top 10 most accident prone parts of a caravan revealed! The very nature of caravanning means that accidents can and do happen. If you’ve ever had a bump, been involved in a road collision, a manoeuvring mishap or a little accident inside your caravan, you’ll know that many areas of a caravan can prove surprisingly accident prone. We’ve taken a look back at our customers’ caravan insurance claims made for accidental damage since 2012 to identify the panels and parts of a tourer that are most at risk. The average costs of repair will make you glad you’ve invested in specialist insurance cover. The first claim statistic we uncovered revealed that over 12% of claims made over the past three years were for damaged windows, making them the number one most accident prone part of a caravan amongst our customers. Window repair costs range from hundreds to thousands of pounds, on average though, claims of this sort averaged £1282 to repair according to our claims records. We saw little evidence of any claim patterns when researching window damage, but like panels, windows are vulnerable to scratches and cracks. Claims of this kind really do come in all shapes and sizes; we’ve handled claims where customers have accidently ripped out their caravan’s toilet window after a misjudged manoeuvre. 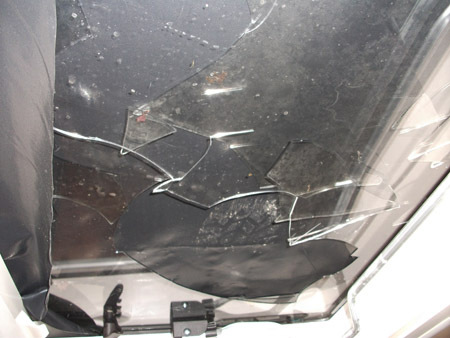 Loose aerials, flying pigeons and kayaks fallen from roof racks have also caused damage to windows! A huge percentage of claims made since 2012 have been for damaged panels. The largest proportion of these claims however, involved panels situated on either side of the caravan. 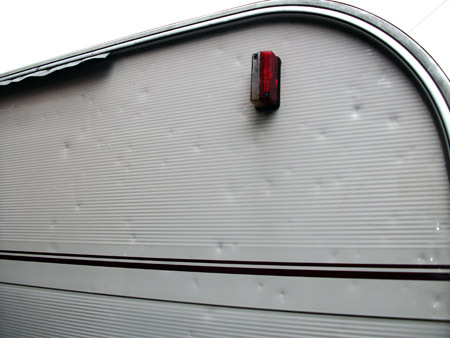 We suspect that the reason side panels are particularly vulnerable to damage claims is because they are more exposed to debris, stones, obstructions than other areas of the caravan which makes dents and scrapes far more likely. When we looked at panel damage claims in more detail it became clear that claims of this nature had a habit of occurring anywhere and everywhere! Some customers had damaged their caravan themselves accidently after reversing, parking or manoeuvring – particularly when on the driveway. In some cases the insurance repair costs reached over ten thousand pounds, but we calculated the average side panel related claim repair to cost over £2000! According to our claims data, door damage is the third most common damage claim made by policyholders. We’ve heard from customers whose doors have dented, scratched and in some cases torn off! In most cases, however, door damage was recorded in conjunction with a more serious incident such as a road traffic accident. Because of this, the average cost of a claim involving a door repair comes in at £2316. We have also heard from a lot of customers who have experienced caravan roof damage in recent years. We suspect this is because back in 2012, we saw a huge influx of insurance claims after severe hailstorms were recorded in various parts of the UK. 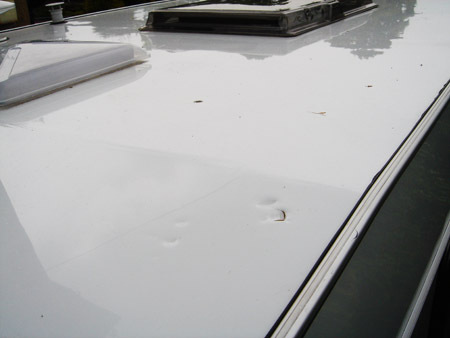 Many customers reported golf ball sized dents, damaged paintwork and deep markings on the roof of their caravan. On average claims of this nature cost £2358 to repair. Our claims data revealed the fifth most accident prone part of a caravan to be back panels which, with claims involving rear panel damage costing £2758 to repair. Claims of this nature have typically included instances where customers have accidently hit something when reversing or when a third party has run into them. Lamp posts, railings, fences and even wheel bins have all found themselves etched into front panels, our claims statistics also revealed, so remember to be extra vigilant when towing in tight spaces. Research indicates that front panels cost an average of £3318 to repair. 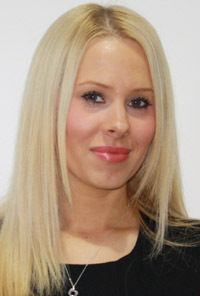 Caravan Guard Claims Liaison Manager, Nicola, reveals another reason why panel damage is so common: “As well as hearing from customers who have scuffed side panels when parking up and manoeuvring, we also hear from policyholders whose awnings have caused damage to the caravan’s front panels during high winds and storms. We were surprised to see skylight damage rank in the top ten. Like caravan roofs, skylights are particularly vulnerable to the effects of bad weather such as strong wind and hail. A-Frames proved particularly accident prone; on average they cost £1150 to repair, making them another area to look out for. Last year we heard from one customer whose caravan had come away from the tow bar and ripped across the A-Frame, jockey wheel and electric cables! Damaged carpets also ranked highly in our most common accidental damage claims since 2012. Most customers report spillages and scuffs on their caravan’s carpet so repair costs tend to be lower than the other claims mentioned – just £141 on average. Despite worktop damage claims being few and far between amongst our policyholders, over the past three years, they have cost almost £700 to repair on average. It is well worth ensuring items in cupboards above worktops are secure whilst towing to avoid unnecessary damage. 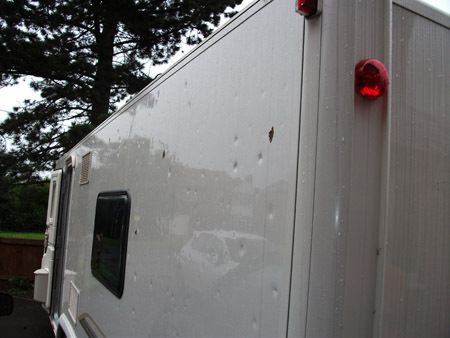 A number of customers also reported damage to their caravan’s paintwork in 2014. Although scratched and cracked paintwork doesn’t always result in a huge repair bill, finding a reputable work shop to carry out the work to a high standard can be a bit of a nuisance. Another reasonably common claim is for cracked shower trays. Again we’d advise against leaving heavy unsecured items such as large shampoo bottles over your shower tray when preparing to tow your caravan. 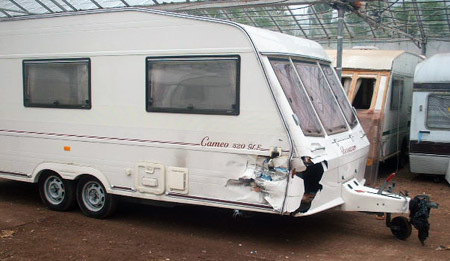 Have you ever accidentally damaged your caravan? 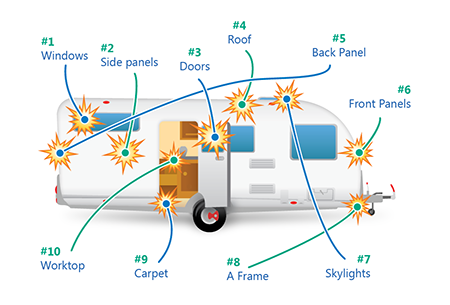 If you’ve ever had to make a claim on your insurance for caravan damage, which part of the caravan was affected the most? Did the repair costs surprise you? Get in touch using the comment box below! Note: All details correct at time of publication but may be subject to change. How would you rate this article? Nice post. It is very informative post about ultimate guide the best travel blackout blind. I love reading this post. It is very useful post for everyone.keep posting and keep sharing like this. I have been caravanning for many years and only once have had to have the front rebuilt due to buying a caravan with bad damp in it took the seller to court and got all my money back. But a lot of people don’t know about a place called Halesowen Caravans they are on Amber Way In Halesowen. They do all the spare parts you will ever require and can them. They also do storage and servicing of caravans. Avondale has gone bust and all the spares are down at the above place. They can be contacted on 0121-550-7949 ask for Steve or Terry you can mention that I have given you there address and telephone number. There are a numbers of factors involved. The car/caravan’s worth, the postcode in which it’s stored, driver claims history, experience and security requirments etc. It’s difficult to pinpoint why one premium differs from the other. Caravan floor and wheel arch was damaged following a blow out on the M25. Thanks to RAC for changing the wheel in dangerous conditions and to Caravan Guard for arranging a quick repair which was cheaper than I expected. It’s great to hear such positive feedback from an existing customer, thank you! Fingers crossed the same doesn’t happen again! 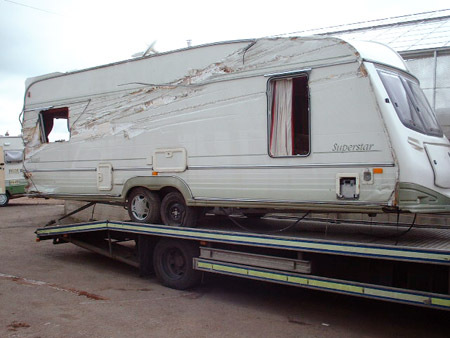 I haven’t ever claimed for damage, nor have I ever had any damage in the ten years since I switched to caravanning from camping. I am HORRIFIED at the prices above! Somebody is making a lot of money there somewhere!!! I’ve replace panels in my older caravans after damage, and I say again, somebody is making a lot of money there. Even if I costed my time at £30 an hour, the eventual cost wouldn’t have been more than 25% of the above amounts. I’m in the wrong business! Spare part prices are ridiculously high and delivery times are appallingly long. Insurance companies are best placed to out pressure on manufacturers to improve this situation. Hi D Shearer, in some of these cases damage was done following a more serious incident or accident. We appreciate spare parts are often costly which is why we feel it’s important to make you aware that such claims can and do occur. So it’s always worth taking extra care when towing and of course maintaining the caravan all year round. © 2019 Caravan Guard Limited, registered in England Number 4036555 at New Road, Halifax, West Yorkshire, HX1 2JZ United Kingdom. Tel: 01422 396 769. Email: info@caravanguard.co.uk. We are open 8am - 8pm weekdays, 9am - 4pm weekends & most bank holidays. Caravan Guard Limited is authorised and regulated by the Financial Conduct Authority. Cover only available to UK residents (including Northern Ireland). Calls may be recorded. 9/10 rating (rounded to nearest whole number) based on 340 claimants (touring caravan and motorhome) surveyed during 2018. 5 Star Defaqto Ratings apply to the Caravan Guard touring caravan policy and the Leisuredays holiday caravan policy. Customer Service Award winner at the UK Broker Awards 2018. Speak to our Halifax based expert advisers about your insurance needs. We're open 8am - 8pm weekdays, 9am - 4pm weekends & most bank holidays.